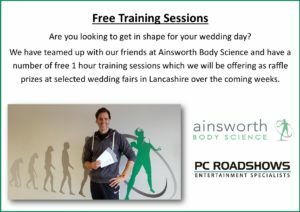 We have teamed up with our friends at Ainsworth Body Science to offer free sessions with one of their personal trainers. They have given us some gift vouchers offering a free 1 hour training session. During this time they will discuss your goals and aims, put together a plan to help you achieve these and get you into the fitness studio to go through the designed training programme. This is a fantastic offer especially for those who are looking to loose weight before a specific occasion or event such as your wedding day. With this in mind we are offering the gift vouchers as raffle prizes during selected wedding fairs we are exhibiting at in Autumn 2018. The dates of all our wedding fairs are updated regularly on our Facebook Page. Follow the link to have a look at the Ainsworth Body Science website and the services they offer.